I've been sitting on this Powder Perfect Halloween duo for what feels like an eternity and I'm so excited that I finally get to show them to you! 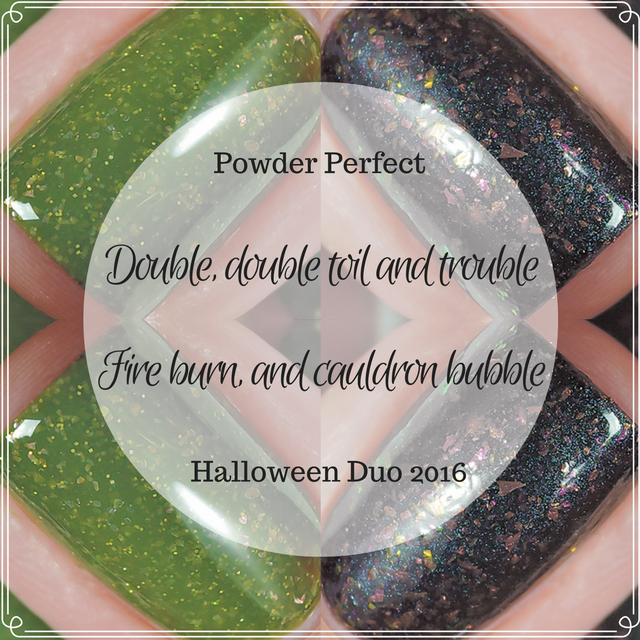 Those of you lucky enough to have seen Powder Perfect at CosmoProf NA earlier this year would have had a sneak peek at these already, but it's finally time for them to be released into the world! A deep, dark eggplant with a multichrome overlay that shifts to gorgeous green that just didn't want to show up for me on camera. It's also full of amazing multichrome flakes that shift from fuchsia to coppery green. It's murky and weird and perfectly Halloween! Oh, and it comes to life with a matte top coat! Those flakies light up like nothing else! I used Powder Perfect's Mattificent top coat which I am utterly obsessed with. I loved the formula, an absolute dream to apply. I can't quite describe it - maybe a metallic jelly? Juicy blackened crelly? Whatever it is, it's smooth and opaque in two coats. The perfect olive green, bold and murky, with iridescent pink flakes and holo gold microglitter. I needed this in my life and Powder Perfect delivered. I'm kind of at a loss for words, it's filthy beautiful. Another beautiful formula here, so easy to apply. The flakes and glitter glide on effortlessly. It's opaque in 3 coats and has such grimy depth! Powder Perfect's Halloween duo will be available from 10am AEST September 30th (find your time zone here).